, who once enjoyed the reputation of a philosopher, the eldest son of sir Everard Digby, was born at Gothurst in Buckinghamshire, June 11, 1603. At the time of his father’s death, he was with his mother at Gothurst, being then in the third year of his age: but he seems to have been taken early out of her hands, since it is certain that he renounced the errors of popery very young, and was carefully bred up in the protestant religion, under the direction, as it is supposed, of archbishop Laud, then dean of Gloucester. 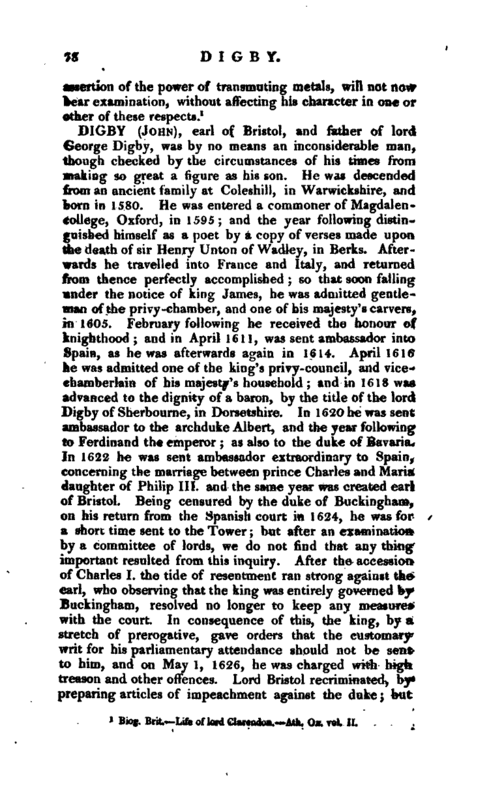 Some have said, that king James restored his estate to him in his infancy; but this is an error; for it was decided by law that the king had no right to it. About 1618 he was admitted a gentleman-commoner of Gloucester-hall, now Worcester college, in Oxford; where he soon discovered such strength of natural abilities, and such a spirit of penetration, that his tutor, who was a man of parts and learning, used to compare him, probably for the universality of his genius, to the celebrated Picus de Mirandula. After having continued at Oxford between two and three years, and having raised the highest expectations of future eminence, he made the tour of France, Spain, and Italy, and returned to England in 1623; in which year he was knighted by the king, to whom he was presented at the lord Montague’s house at Hinchinbroke, October 23. 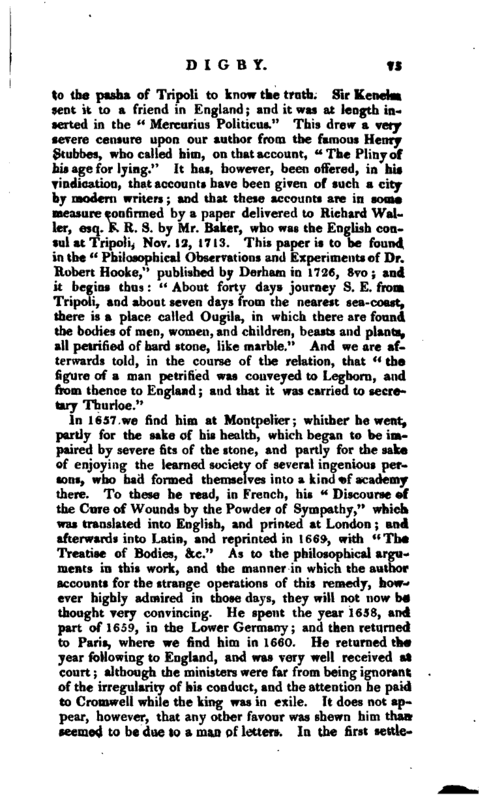 Soon after, he rendered himself remarkable by the application of a secret he met with in his travels, which afterwards made so much noise in the world under the title of the “Sympathetic Powder,” by which wounds were to be cured, although the patient was out of sight, a piece of quackery scarcely credible, yet it was practised by sir Kenelm, and his patient Howell, the letter-writer, and believed by many at that time. 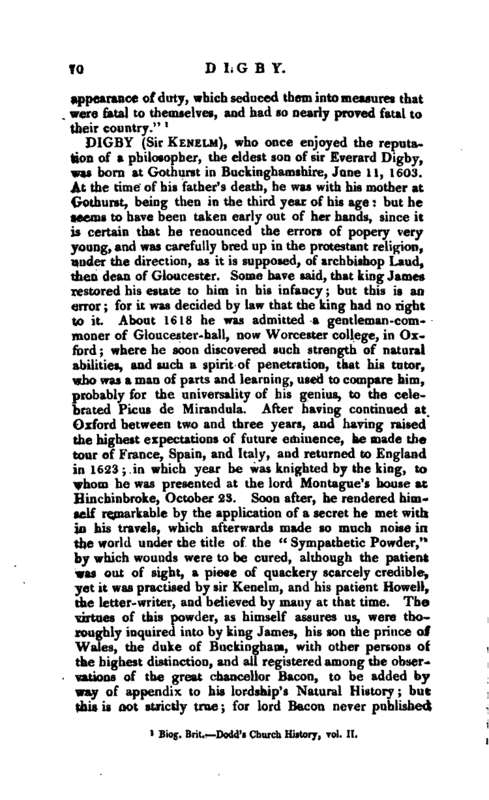 The virtues of this powder, as himself assures us, were thoroughly inquired into by king James, his son the prince of Wales, the duke of Buckingham, with other persons of the highest distinction, and all registered among the observations of the great chancellor Bacon, to be added by way of appendix to his lordship’s Natural History; but this is not strictly true; for lord Bacon never published | that Appendix, although he does give a story nearly as absurd. After the death of James, he made as great a figure in the new court as he had done in the old; and was appointed a gentleman of the bed-chamber, a commissioner of the navy, and a governor of the Trinity-house. Some disputes having happened in the Mediterranean with the Venetians, he went as adoiiral thither with a small fleet in the summer of 1628; and gained great honour by his bravery and conduct at Algiers, in rescuing many English slaves, and attacking the Venetian fleet in the bay of Scanderoon. 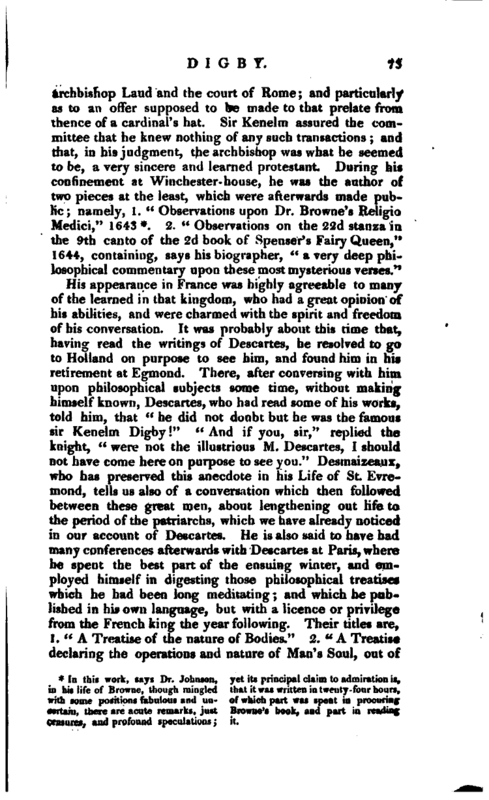 In 1632 he had an excellent library of Mss. 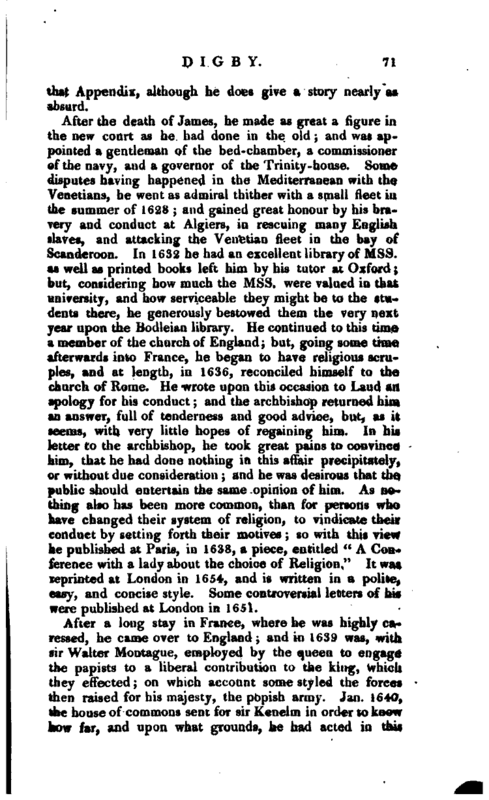 as well as printed books left him by Ins tutor at Oxford; but, considering how much the Mss. were valued in that university, and how serviceable they might be to the students there, he generously bestowed them the very next year upon the Bodleian library. He continued to this time a member of the church of England; but, going some time afterwards into France, he began to have religious scruples, t-nd at length, in 1636, reconciled himself to the church of Rome. He wrote upon this occasion to Laud an apology for his conduct; and the archbishop returned him an answer, full of tenderness and good advice, but, as it seems, with very little hopes of regaining him. In his letter to the archbishop, he took great pains to convince him, that he had done nothing in this affair precipitately, or without due consideration; and he was desirous that the public should entertain the same opinion of him. As nothing also has been more common, than for persons who have changed their system of religion, to vindicate their conduct by setting forth their motives; so with this view he published at Paris, in 1638, a piece, entitled “A Conference with a lady about the choice of Religion.” It was reprinted at London in 1654, and is written in a polite, easy, and concise style. 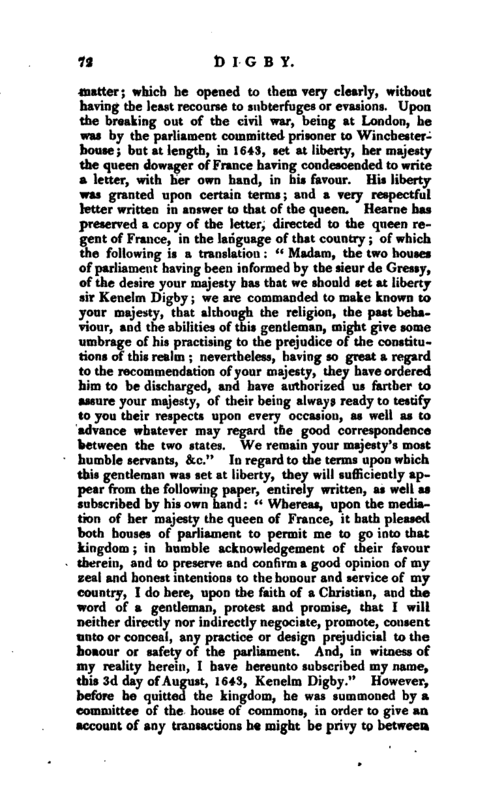 Some controversial letters of his were published at London in 1651. In this work, says Dr. Johnson, in his life of Browne, though mingled with some positions fabulous and uncertain, there are acute remarks, just Censures, auc! profound speculations; yet its principal claim to admiration is, that it was written in twenty-four hours, of which part was spent in procuring Browne’s book, aud part in reading it. | which the immortality of reasonable Souls is evinced/' Both printed at Paris in 1644, and often reprinted at London. He published also, 3.” Institutionum peripateticarum libri quinque, curn appendice theologica de origine mundi," Paris, 1651: which piece, joined to the two former, translated into Latin by J. L. together with a preface in the same language by Thomas Albius, \hat is, Thomas White, was printed at London in 4to, 1C69. After the king’s affairs were totally ruined, sir Kenelm found himself under a necessity of returning into England in order to compound for his estate. The parliament, however, did not judge it proper that he should remain here; and therefore not only ordered him to withdraw, but voted, that if he should afterwards at any time return, without leave of the house first obtained, he should lose both life and estate. Upon this he went again to France, where he was very kindly received by Henrietta Maria, dowager queen of England, to whom he had been for some time chancellor. 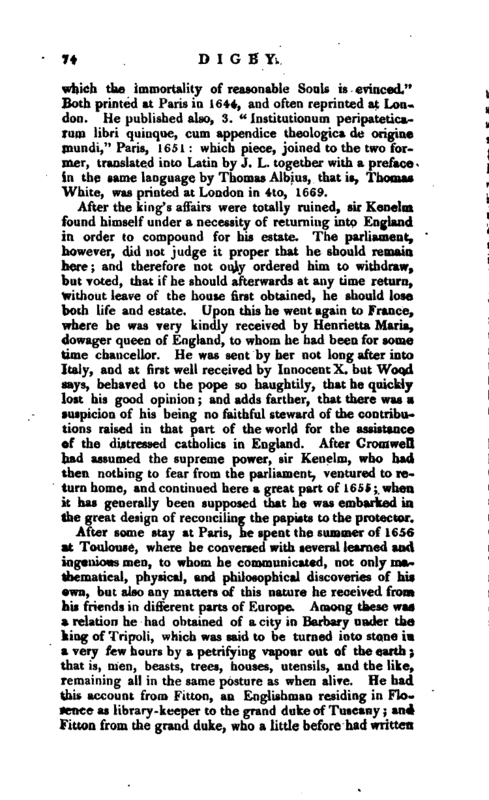 He was sent by her not long after into Italy, and at first well received by Innocent X. but Wood says, behaved to the pope so haughtily, that he quickly lost his good opinion; and adds farther, that there was a suspicion of his being no faithful steward of the contributions raised in that part of the world for the assistance of the distressed catholics in England. After Cromwell had assumed the supreme power, sir Kenelm, who had then nothing to fear from the parliament, ventured to return home, and continued here a great part of 1655; when it has generally been supposed that he was embarked in the great design of reconciling the papists to the protector. In 1657 we find him at Montpelier; whither he went, partly for the sake of his health, which began to be impaired by severe fits of the stone, and partly for the sake of enjoying the learned society of several ingenious persons, who had formed themselves into a kind of academy there. To- these he read, in French, his “Discourse of the Cure of Wounds by the Powder of Sympathy,” which, was translated into English, and printed at London; and afterwards into Latin, and reprinted in 1669, with “The Treatise of Bodies, &c.” As to the philosophical arguments in this work, and the manner in which the author accounts for the strange operations of this remedy, however highly admired in those days, they will not now be thought very convincing. He spent the year 1658, and part of 1659, in the Lower Germany; and then returned to Paris, where we find him in 16CO. He returned the year following to England, and was very well received at court; although the ministers were far from being ignorant of the irregularity of his conduct, and the attention he paid to Cromwell while the king was in exile. It does not appear, however, that any other favour was shewn him than seemed to be due to a man of letters. In the first | settlement of the royal society we find him appointed one of the council, by the title of sir Kenelm Digby, knight. Chancellor to our dear mother queen Mary. As long as his health permitted, he attended the meetings of this society; and assisted in the improvements that were then made in natural knowledge. One of his discourses, “Concerning the Vegetation of Plants,” was printed in 1661; and it is the only genuine work of our author of which we have not spoken. 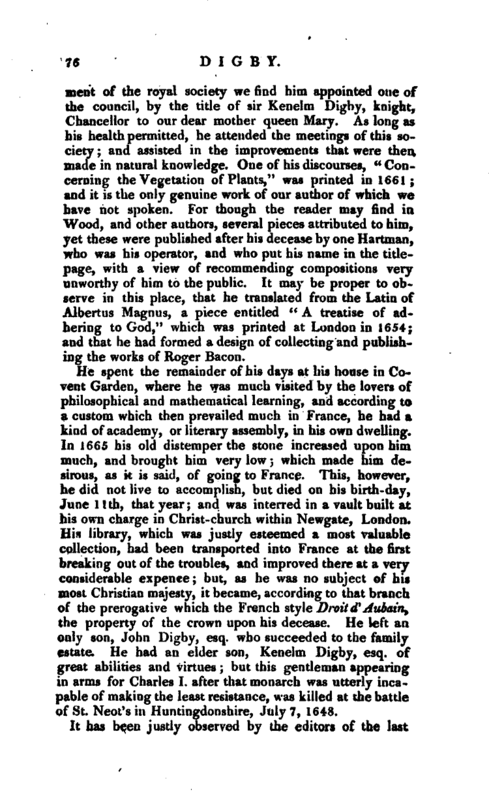 For though the reader may find in Wood, and other authors, several pieces attributed to him, yet these were published after his decease by one Hartman, who was his operator, and who put his name in the titlepage, with a view of recommending compositions very unworthy of him to the public. It may be proper to observe in this place, that he translated from the Latin of Albertus Magnus, a piece entitled “A treatise of adhering to God,” which was printed at London in 1654; and that he had formed a design of collecting and publishing the works of Roo-er Bacon. He spent the remainder of his days at his house in Covent Garden, where he was much visited by the lovers of philosophical and mathematical learning, and according to a custom which then prevailed much in France, he had a kind of academy, or literary assembly, in his own dwelling. In 1665 his old distemper the stone increased upon him much, and brought him very low; which made him desirous, as it is said, of going to France. This, however, he did not live to accomplish, but died on his birth-day, June 11th, that year; and was interred in a vault built at his own charge in Christ-church within Newgate, London. His library, which was justly esteemed a most valuable collection, had been transported into France at the first breaking out of the troubles, and improved there at a very considerable expense; but, as he was no subject of his most Christian majesty, it became, according to that branch of the prerogative which the French style DroilcTAubain, the property of the crown upon his decease. He left an only son, John Digby, esq. who succeeded to the family estate. He had an elder son, Kenelm Digby, esq. of great abilities and virtues; but this gentleman appearing in arms for Charles I. after that monarch was utterly incapable of making the least resistance, was killed at the battle of St. Neot’s in Huntingdonshire, July 7, 1648. 1 Biog. 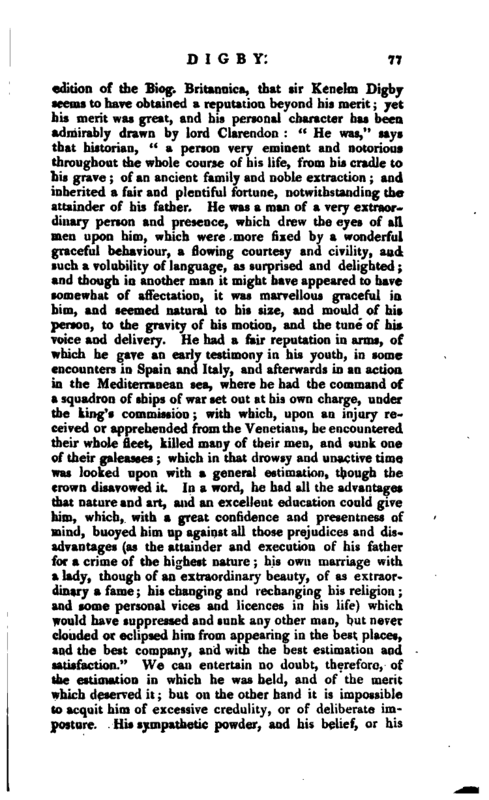 Brit, Life of lord Clarendon. —Ath. Ox. vol. II.